In previous versions of Evernote for Android was possible to turn off the screen or switch to other applications when a new audio note had begun, but this is impossible in the new version and is a problem because it forces the screen wil keep on and the note in the foreground with the consequent drain on the battery and the inability to access other phone functions without finishing the audio recording. I wonder if this will be fixed in future versions as it is a much needed feature for me. Well, you've come to the right place. Developers crawl the forums, so they'll definitely see your request. You may also want to submit a support ticket with this feedback (link in my signature). Just bumping this up. The iPad/iPhone app can record while Evernote is in the background or the screen is off, and many other voice recorder applications for Android can do this as well. Evernote for Android is lagging behind in this department, and it's a big problem when I'm using my Nexus 7 to record a lecture and I need to switch back and forth between Evernote and an ebook in another app. Any chance we could get a response from the developers about this? Hey Evernote team, I just got off a chat where I had the same discussion. They said evernote forum posting will help. Please post. what is weird is this feature works on my phone but not my tablet. We need to record and be able to go to other apps or let the screen darken to save power in between notes without the recording stopping. If not other apps atleast keep the recording on while the screen goes off to save power. This is huge in class where the lecture might be 10 mins and only 3 min are notes taking opps. I believe it worked this way on older versions. Weird to have new version revert. Please help, we love evernote. I'm in full agreement I just switched from Apple to iPod and I'm upset that I don't have the same ability to record in the background while I use other apps or turn off my screen to save power. It's really annoying and ought to operate just like the Apple version. Has anyone gotten and ETA from development on this issue? +1 for background recording on android. We did have this feature in older versions. Oh, NO! I just signed up for Evernote Premium, today. I am glad that I only got it to try for one month. I will not be able to use Evernote for this reason. Wish I had read this a couple of hours ago! Contact tech support. They may be able to back you out. No promises, though (I'm not an Evernote employee). Either that, or use your one month's upload quota to the max. Evernote! Please help this is needed. The devices are made to multitask or save screen power while other apps run. We need background recording back. Is anyone at Evernote listening? Yes, Evernote staff read these posts. They don't always respond, since this is a user forum, not an official support forum. So how and where do we send to the right people so they see it? Then this post is like just venting. People who actually can make changes need to know. Usually, I'd go to the main Evernote page and look for Support -- in this case it's at the bottom of the page, labelled Support Home. Also, some people, mainly moderators, have the support link in their signatures, as I do. As I said, Evernote staff do read these posts here, and the information gets to them. They may not answer here, though sometimes they do. Opening a support request is the official way for you to get Evernote support. I'd also like to be able to record audio ion the background whilst using other apps and with the screen off. This is a very said state of affairs. There is no indication that Evernote knows or cares about this shortcoming. I have reported the issue where I linked to this thread. I suggest others do the same. Especially if you are a premium user. This is a very old issue (Nov of 2011 at least) and it's time to get it resolved. As i said in the other thread you posted on, if you have what you think is a bug then open a support ticket. Please, development team, (re)add this feature to Evernote, if for no other reason than to help users save the battery power that is presently being wasted keeping the screen alive during audio recordings. This is an essential feature. This is disappointing. I'm a premium user and one of the reasons I upgraded to premium was so that I could record meetings where I was assigned to note taking. The first time I tried it, I turned it on and let it run the whole meeting, only to find out after the meeting that it had stopped as soon as I turned the screen off. I'm lucky I took notes during the meeting instead of waiting to transcribe from my recording later! This is a VERY basic function and it's shocking that this isn't included in the EN android app. +1 for "easy voice recorder". "As usual" on Android, EN's data capturing capabilities always have that "unfinished" and clunky feel, so it's always better to use a 3rd party app to capture something like image, voice, yes even a text note, then send it to EN for storage. I find the main reason to even use EN on Android is for consolidation and search, which fortunately is something it does very well. Bumping this, please - we need this feature! I have not found a good audio recording application BTW, where the voice is clear even though I am sitting normally on the first row. 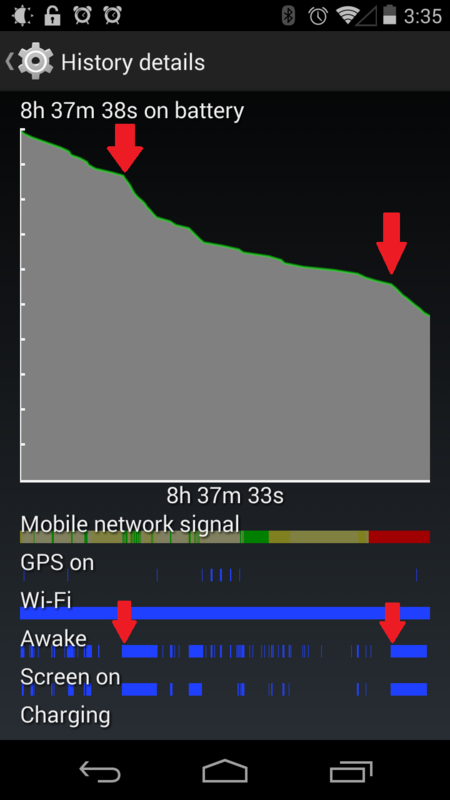 Here's what it does to my battery on a Moto X. The big red arrows indicate when I started using the Evernote audio note recorder. On this case we recommend you to increase the waiting time for the screen saver to come up since the Android System will stop any pending action on any app to change to the saving energy mode. This is something that had to be changed from the Android Settings since it's the way the OS is preconfigure. We hope this information is useful to you. I explained to them that I use RecForge on Android all the time. It continues to record even in power saving mode and as I switch to other applications. I also explained that I do not have this problem on my iPad running iOS 7. Not to be too political, but multitasking/background tasking is substantially better on my Android phone than my iPad. What's the problem at Evernote?